Peddinghaus automated saw and drill line with fully integrated material handling system. 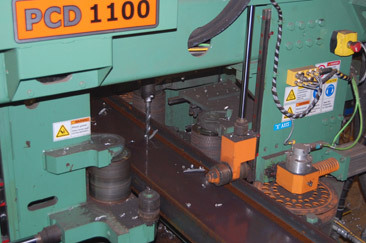 Three industrial band saws with automated feed systems for sawing miscellaneous shapes. High Definition Plasma CNC Plate Burning Table. Forming capacity for up to 50’ plates with a combination of in-house 400-ton press brake and outsourced partners. Digitally-controlled submerged arc welder with integrated turning rolls. Our covered and heated paint facility is capable of producing a high-quality industrial finish on any shippable load. We have good access to specialty finish providers, including two galvanizers. Most shippable loads can be galvanized in short turn-around times. Network of outside structural steel detailers to supplement our internal capabilities. Detailers use SDS2 and Tekla Structures 3D modeling programs, in addition to AutoCAD. BIM file data is available for integration into your system.